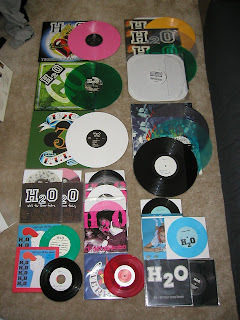 The other day someone posted a thread on Vinyl Collective about H2O and what was involved in collecting everything they put out on vinyl. I was about to leave to go get some lunch with Tom, but I thought it would cool to put everything I have together real quick, snap a picture, and post it. I also thought it would be a great excuse to get a picture for a blog post. So here it is. My current H2O Collection. I think it's the best out there, although I'm not totally sure. Everready on Blue, and Pink. Demo on Clear and Purple. Nothing to Prove on Blue and White. White is easy, and Blue I would have had, but ebay froze when my brother tried to bid on it for me. Although he could have been sleeping and just lied. Then some misc on black and Japan presses that I'm not worried about at all. It's really just the colored ones that have me slightly perplexed. Especially the Pink Everready which I didn't know existed until someone with a pretty nice collection of his own, replied to that VC thread. Cool picture. Did you ever get any more info on that test press? both Jeff and I still have no idea what the hell it is. It's pretty disconcerting.